The Sidney Heath department store stood in Caer Street, Swansea, on the spot that is now Yates Wine Lodge, opposite Castle Square. This photograph forms part of a collection of photographs which depict many shop fronts and fittings of Swansea shops during the early 1950s. 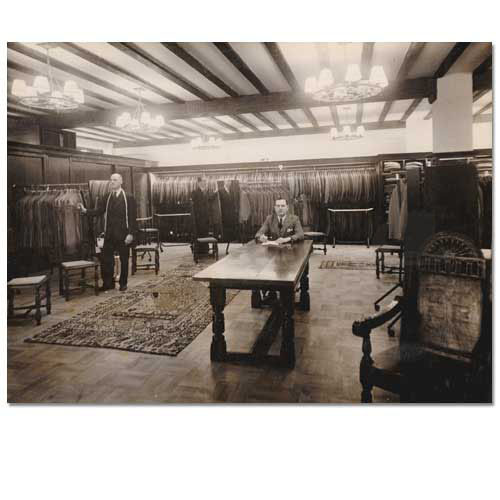 They were originally commissioned by Percy Symmons and Sons (Swansea) Ltd., as examples of their shop fitting and joinery work. Today however, this photograph also affords us a glimpse into the more formal, and conservative air to certain aspects of shopping in the 1950s.